I’ve been considering a grilled cheese sandwich (GC) post for a while now but never knew where to start. I’ve eaten dozens of GCs since joining the It’s What’s Between staff, some good, some bad. But we simply don’t have the time and resources to review all of them. Later in the day, I discussed at length my love of Kraft singles with two of my associates. 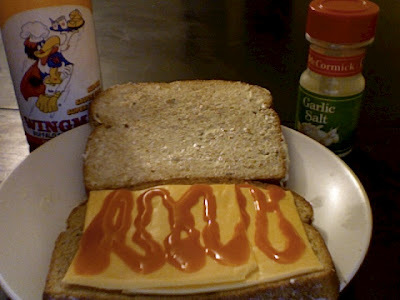 (Quick tangent: I refer to all single-slice wrapped cheeses as Kraft singles regardless of brand. This is a rare exception to the “use generic titles rule,” e.g., adhesive strips vs. Band-Aids. Calling all boxed macaroni and powdered cheese foodstuffs Kraft dinner is another acceptable exception.) One of them suggested buying cheese as blocks and making my own slices for grilled cheese purposes using a kind of cheese guillotine, which I will not do. We've come this far with sliced bread (and what’s better than that) and sliced cheese and I’m not taking a step backward. I suspect his argument was little more than thinly veiled liberal anti-packaging propaganda anyway. Finally, a Manhattan-based magazine editor sent me a link to Gridskipper’s guide to New York’s best grilled cheese sandies. Judging from this page, Brooklyn’s Picket Fences is where it’s at: “The buttery sourdough requires extra napkins for greasy fingers, but it's satisfyingly crunchy, and the cheddar cheese is plentiful but not too oozy.” Sounds perfect to me, and a sandyquest to Picket Fences is now on the itinerary for my next visit to our nation’s capital (circa 1787). Also, despite its annoyingly fancy-pants add-ons (namely, the truffles and pears), I may need to check out ’wichcraft purely based on its clever name. There is much more to be said about the GC, and this post is already too long. My next step is to hit up nearby Chedd’s and find out how the professionals’ work compares to my own finely tuned cheese grilling skills. I'll end this with the definitive list of What’s OK to Put on a Grilled Cheese sandwich beyond the essential ingredients: cheese, bread and butter. The occasional exception to be considered on a case-by-case basis by the Grand Sandy Counsel (GSC). For more information on the GSC, please contact the Sandwich, Ill. Public Safety department. when at Ched's, I highly recommend the Hot Gobbler with some hot sauce, theirs or yours, but if you want to stick to the classic, the Big Dipper is hard to beat. Good tip — I usually enjoy anything with hot sauce and cheese. By the way, do not get the Thanksgiving-style sandwich from King Soopers. It is a cheap rip-off of the Pat's version you described. Pictures are forthcoming. What!? The sandyblog is slipping ... Already a week into GC month and no commentary. Thanks for letting me know this is a thing!